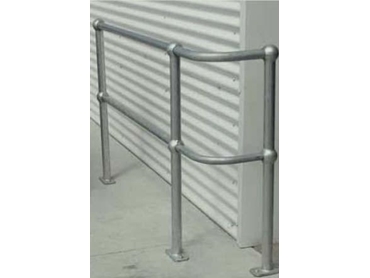 Barrier Group Pty Ltd offers a range of modular handrail systems, self closing gates and injection moulded modules designed to provide flexibility in outdoor applications. The Ball-fence tubular handrail systems comprise of stanchions in various configurations, a top rail and a centre rail. Self closing gates are available for all Ball fence installations and can be installed quickly for left or right hand operation and to open inwards or outwards as required. The gates offer great flexibility of use with adjustable hoop length and return spring pressure. Barrier Group also supplies the innovative Menni injection moulded modules designed to protect physical assets by preventing vehicles from causing damage. When used with Ball-fence systems, Menni prevents forklifts and other vehicles from encroaching into pedestrian zones while protecting the Ball-fence. Manufactured in Australia from LLDPE and available in solid hi-viz safety yellow colour, Menni is an extremely tough range of impact absorbing modules.